Ichimura Uzaemon III held the name of Ichimura Takenojô for a while. The founder of the line Ichimura Takenojô I held this name from 1663 to the 4th lunar month of 1679. 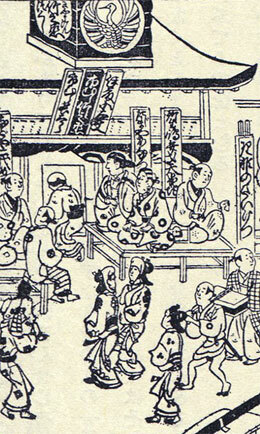 Ichimura Takenojô I (bottom/right) in an illustration from the 1674 hyôbanki "Shin Yarô Hanagaki"
Born in Edo in 1680. He was the son of Ichimura Uzaemon V and received the name of Ichimura Takematsu II. He later took the name of Ichimura Takenojô II (according to the latest researches done at the National Theatre in Tôkyô). He became the official zamoto of the Ichimuraza in the 12th lunar month of 1684 when His father retired. It goes without saying that his father was still the real manager of the theater, organizing everything from behind the scenes because Takenojô was too young. He died the 24th day of the 11th lunar month of 1686 . He never held the name of Ichimura Uzaemon VI but was considered as the sixth member of this line of zamoto. 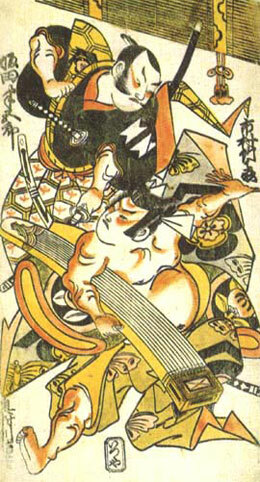 Born in Edo in 1681. 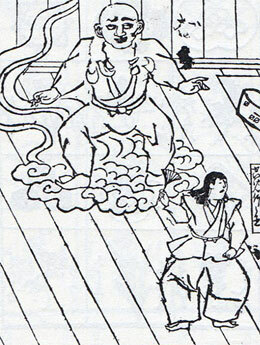 His father Zenbê was the owner of the Tea House Kikuya at the Ichimuraza and his mother was the elder sister of the zamoto Ichimura Uzaemon V. He received the name of Ichimura Chôtarô. He was adopted by Ichimura Uzaemon V in 1686, after the death of Ichimura Takenojô II, most likely took the name of Ichimura Takenojô III (according to the latest researches done at the National Theatre in Tôkyô) and became the puppet manager of the Ichimuraza. His adoptive father died in 1691 and he had to start to really manage the theater. He worked as a zamoto for a few years and died the 21st day of 4th lunar month of 1698 . 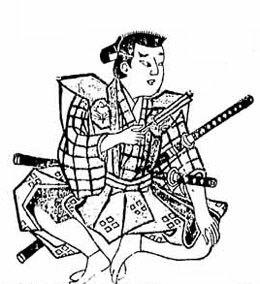 He never held the name of Ichimura Uzaemon VII but was considered as the seventh member of this line of zamoto. 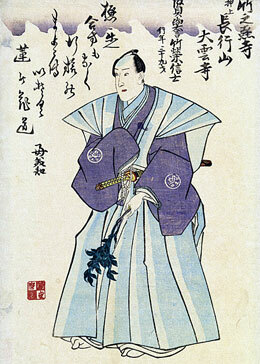 The actor Ichimura Uzaemon VIII held the name of Ichimura Takenojô IV from 1703 to the 10th lunar month of 1737. The actor Ichimura Takenojô V held this name from the 1st lunar month of 1851 to the 8th lunar month of 1851. The actor Nakamura Tomijûrô V held the name of Ichimura Takenojô VI from May 1964 to September 1972. The 24th day of the 11th lunar month of the 3rd year of the Jôkyô era was the 7th of January 1787 in the western calendar. 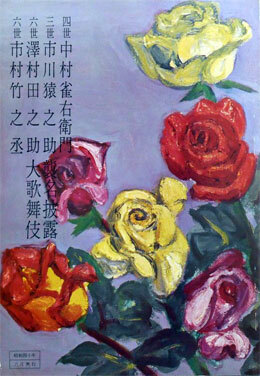 The 21st day of 4th lunar month of the 11th year of the Genroku era was the 30th of May 1698 in the western calendar.